President Tran Dai Quang and Indonesian President Joko Widodo agreed to strive to bring two-way trade to 10 billion USD towards a trade balance during their talks in Ha Noi on September 11. 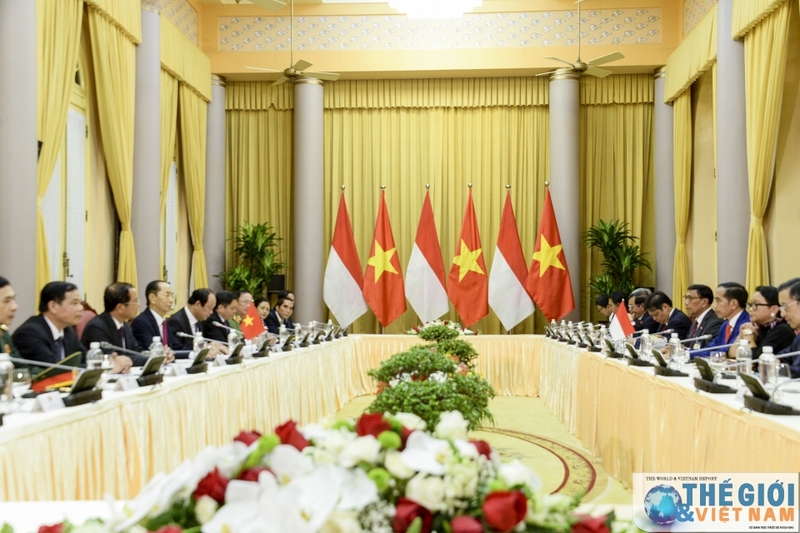 The Vietnamese President welcomed the first Vietnam visit by Widodo and expressed belief that the visit will make important contributions to further promoting the traditional friendship and strategic partnership between the two countries. Discussing bilateral ties, the two Presidents stressed the need to further deepen the bilateral strategic partnership in a more practical and effective way for the benefit of the two countries’ people, and for peace, cooperation and prosperity in the region and the world, in the context of deep changes in the Asia-Pacific region in general and ASEAN in particular. At the meeting between Presidents of the two countries. Both sides agreed to increase all-level visits via the State, government, National Assembly channels and people-to-people exchange; make effective use of bilateral cooperation mechanisms and share views on regional and global issues of mutual interest. They spoke highly of the signing of an action programme on realising the bilateral strategic partnership for the 2019-2023 period, towards celebrating the 10th anniversary of the establishment of strategic partnership by 2023. The Indonesian President took note of Vietnam’s proposal on removing regulations on the rate of local content in Vietnam’s key export items such as mobile phones, television, agro-forestry-fisheries, steel, construction material and, electrical equipment, making it easier for those products to enter the Indonesian market. The two sides spoke highly of the outcomes of national defence-security collaboration over the past years, especially the implementation of the Memorandum of Understanding on strengthening cooperation between defence officials and related activities signed in 2010 and the Declaration on Joint Vision on Defence Cooperation for the 2017-2022 period. They agreed to enhance cooperation between their navies and air forces, and partnership in defence industry and crime prevention. Host and guest consented to assign the technical task force meeting to accelerate negotiations on demarcation of the two countries’ exclusive economic zones in line with international law, especially the 1982 United Nations Convention on the Law of the Sea (1982 UNCLOS). They affirmed that the issue of arrested fishermen and fishing vessels should be handled in an humanitarian spirit and in accordance with the two countries’ friendship and international law. On the occasion, they welcomed joint work to address illegal fishing, including the signing of a joint communiqué on voluntarily joining international cooperation in preventing illegal, unreported and undocumented fishing, and agreed to make efforts to soon reach a Code of Conduct at sea and sign a memorandum of understanding on marine and fishing cooperation. The two leaders discussed measures to intensify links in the fields of energy, agriculture, culture, tourism, and in marine-based economy, marine sciences and environment, as well as build a consultation mechanism on marine issues. They committed to effectively carry out the agreement in farm produce and consider establishing joint ventures in aquaculture, wood processing and wooden furniture export, expanding tourism cooperation, especially sea and island tourism and soon launching the Hanoi – Jakarta direct flights. On regional and global issues of shared concern, the two Presidents said both sides need to maintain consultation on issues regarding regional security and strategy, coordinate to build a united ASEAN, successfully realise the ASEAN Vision 2025, and enhance ASEAN’s central role in the regional architecture and in dealing with strategic issues in the region. The two sides pledged to work closely together at multilateral forums, especially the United Nations, ASEAN, APEC and ASEM. The two sides affirmed their consistent stances on the East Sea issue, including supporting the peaceful settlement of disputes in line with international law, including the 1982 UNCLOS; refraining from the use of force or threat to use force; fully respecting diplomatic and legal processes. They highlighted the importance of non-militarisation, refraining from activities that could cause or escalate tension, abiding by principles of international law and widely-recognised standards. The two leaders reaffirmed their support of the full and effective implementation of the Declaration on the Conduct of Parties in the East Sea and acceleration of negotiations on a practical and effective Code of Conduct in the East Sea. President Tran Dai Quang received visiting Vietnam-Japan and Japan-Vietnam Special Ambassador Ryotaro Sugi in Ha Noi on September 6.